Leslie Carrara-Rudolph’s “day job” is bringing life to kooky characters and crazy creatures through the art of puppetry. But what happens when the puppets go to bed and Leslie gets a shot at her own solo show? Something exciting of course. 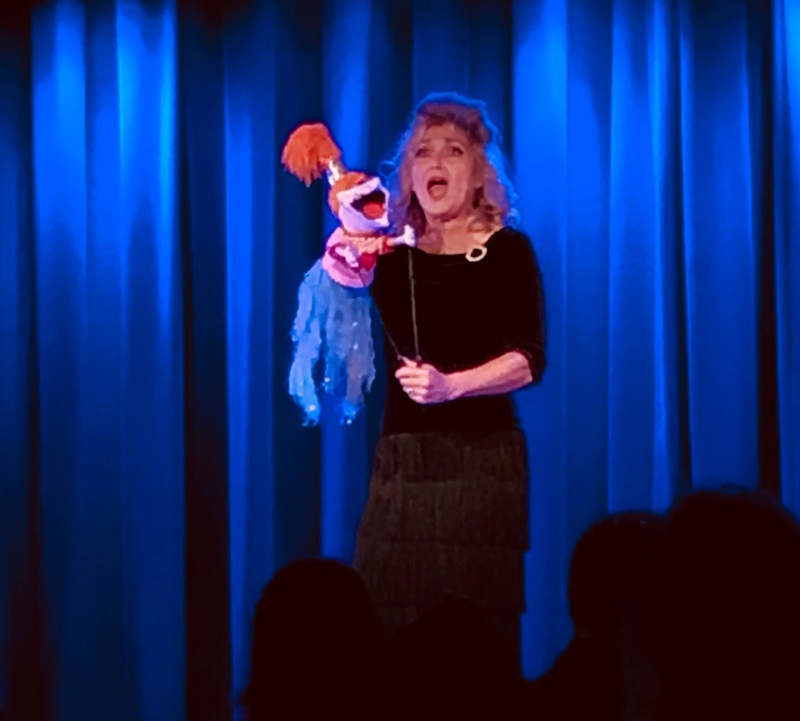 Best known for being Sesame Street’s Abby Cadabby, Leslie Carrara-Rudolph brings her adult cabaret, and some fabulous friends, to the Laurie Beechman for an evening of entertainment and pure imagination. With a motto of anything can happen, What Just Happened is a night of stories, song, and a some unexpected guests, Leslie Carrara-Rudolph offers a sensible cabaret. Carrara-Rudolph has a playful brand of whimsy and weird, both with and without a puppet in hand. And it’s entirely endearing. Using a cute device of creating a cabaret based off of a Buzzfeed article, Carrara-Rudolph tries to fulfill the requirements while still remaining true to herself. If you thought she wouldn’t bring puppets with her, you’d be incredibly wrong. While Abby herself may not make an appearance, a plethora of friends make cameos including Lolly Lardpop, a slightly crude kid. The flow of the show is pretty seamless. There aren’t any holes, and if there are they’re present for comic effect. She strikes a nice balance of straight showtune with hilarious parodies. Just take her shadow puppet re-examination of a Mary Poppins’ hit. Vocally, Carrara-Rudolph has nurtured her voice for characters, yet when she sings as herself, it’s equally as special. While it may be her adult cabaret, it’s probably rated PG-13. Having a room filled with love and support can boost the energy on stage. It was evident that the warmth from the crowd gave Carrara-Rudolph an extra boost. What Just Happened is a special show from a special woman.